As I’ve done for the past four or five years, I’ve been playing on a co-rec intramural Ultimate Frisbee team this spring. Our regular season finished last week, and our first playoff game was Thursday at 6:15 pm. It was pretty hot out (~83 °F), so I didn’t eat much food during the day because my stomach is fairly sensitive to eating+exertion and I didn’t want to feel gross while I was runnin’ around. Because I’d had such a light lunch, I was super hungry once the game was over (we won 14-6!). I didn’t feel like fixing dinner, so we just went to Subway and got sandwiches. Instead of my usual veggie sub, I opted to get the Subway Melt (which has turkey, black forest ham, and bacon). It was good and filling, but probably only about 10% better than the meat-free sandwich. 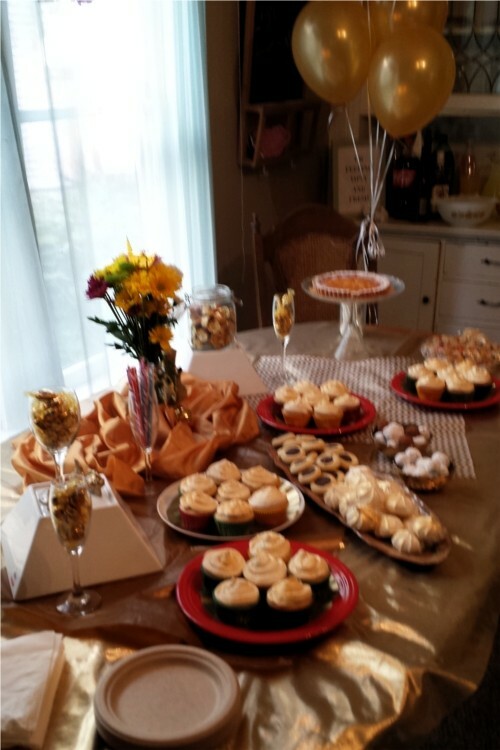 One of our friends is celebrating her golden birthday this year (she turns 25 on May 25th) so she threw a party on Saturday to commemorate the occasion. Folks were encouraged/instructed to dress up a little bit and to incorporate something gold into their attire. 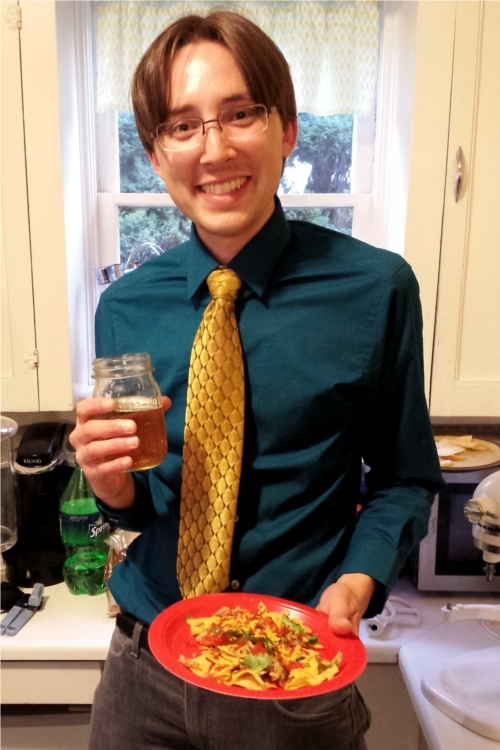 (I went to Goodwill and picked up a swanky, golden, $4 tie.) At the party, there were also tons of golden balloons and origami cranes folded from metallic golden paper and marigold (maybe?) flowers and Werther’s candies in shiny golden wrappers… the theme was artfully embraced and helped make things feel particularly festive. Our hostess cooked up a big ol’ slow cooker full of carnitas and we stuffed ourselves with tasty tacos. There were also tons of handmade desserts on hand including an apple-crepe birthday cake, sriracha+orange+chocolate truffles, cupcakes, and so much more. Everything looked and tasted delicious! It was a truly wonderful birthday party for truly wonderful individual. Hooray! Fancy dessert spread (left) and enjoying some delicious carnitas nachos (right).